On the morning of 3rd May, 1952, there was a power cut at Fryston Colliery close to Castleford. Suddenly the pit was plunged into darkness and the miners could only see by the lights on their helmets. Lister Addy (my Great Granddad) the pit bottom deputy, was not worried until a man shouted “come down here Lister, there’s been an accident”. Addy quickly followed his colleague through the darkness to the bottom of the shaft. A group of miners were looking up the 500m shaft (which is as big as 3 of the chimneys at the power station). The cage was jammed at an odd angle 67m above. A young worker, Jim Winterbottom, was stuck under a truck inside. One of the railway tracks on board had stuck into the shaft wall. Winterbottom might be injured underneath the truck, the miners knew that someone would have to try to reach the cage and help him. While the men discussed ways to tackle the rescue, Addy, a tough and powerful man, decided that he would attempt the rescue. He could not climb up the shaft so decided to go up another shaft and come downwards. He eventually arrived in the other shaft and realised that the trapped cage was now 162m (approximately the height of Blackpool Tower) below them. He got some men to tie three pieces of rope together and fixed one end to a safety harness which he then strapped on. He put on several pairs of thick industrial gloves so that he could begin the descent. Helped by the other miners Addy eventually got onto the greasy winding cable which hung in the middle of the shaft. slowly the other miners let out the safety rope as Addy lowered himself down. As he was nearing the cage his leather gloves wore through causing his hands to burn and a hole had rubbed through his metal toed boots causing a painful burn on his foot too. He continued but was approximately 4.5m away from the cage when his safety rope ran out. He took out his knife and cut himself free from the rope. He was now completely on his own. he quickly slid down the cable until he reached the cage roof. Addy had to make his way down three floors of the cage, he had to do this by making his way on the outside of the cage and without a safety rope risking a fall of 70m. He reached the second deck to find Jim pinned beneath a fully laden truck. Addy set about lifting the truck from the young miner’s body. Mustering all the strength he had he managed to raise the truck and could hear the young lad begin to breathe. He told the lad to wriggle free. Safety rope was now need to prevent both men falling from the cage and down the shaft. Addy had to make his way back to the safety rope he had cut himself from approximately 10m above. He made his way back and cut off a length of rope. On returning to Jim he tied the two of them together. The task to remove the jammed cage now began. Three times Addy had to lift the truck and let it slam to the floor before the cage became loose. The miners waiting at the bottom of the shaft eventually lowered the cage to safety. Addy had a well-earned cup of tea before finishing the remainder of this shift. My Great Granddad was presented with the George Medal at Buckingham palace by the Queen for his bravery. Emily compiled it for a school project called ‘THE HERO IN MY FAMILY’. I thought it deserved a place online. Lister was a very courageous man. i am compiling a register of George Medallists for The Gallantry Medallists’ League and wondered if I could get a copy of the photo of him outside the place in high resolution to include philmcdermott@worcmedals.com Archivist – The Gallantry Medallists’ League. Brilliant story. Just researching my family tree and Lister was my Nan’s brave brother. Lister was indeed a very brave man. 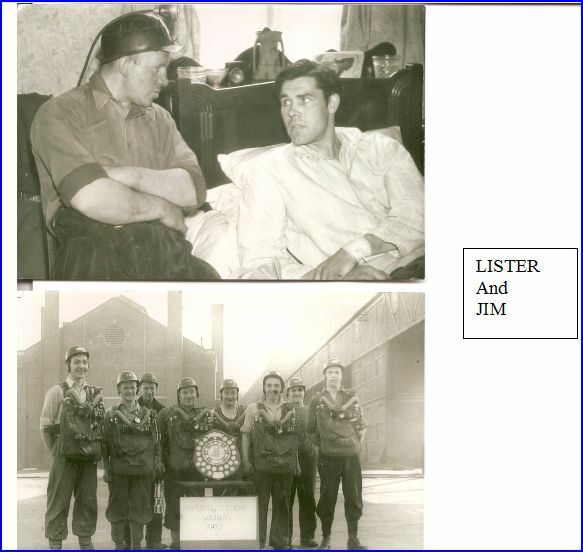 Lister was my very brave uncle; his lovely wife Ivy was my dad’s sister. Emily Hunt, the girl who wrote this, is now 13 years of age, she is also my older sister. Emily has now moved onto getting her own books published! I am now 10 years old and I am wanting to follow in my sisters footsteps, since I am the best in my grade at literacy. I was truly inspired by this piece of writing, I also got to learn more about my great grandad! Thank you, Rebecca. What kind of books does Emily publish?